One of our favorite projects! Simply put, this client was looking for a unique pool. This project is located in Yuma, which is well outside of Unique’s normal service area but due to the nature of the project, its complexity, and Owner Chris Griffin’s love of a challenge, we accepted. Mr. Johnson felt that the local companies would not be able to produce the level of detail and quality he was looking for. He wanted something creative and unusual. 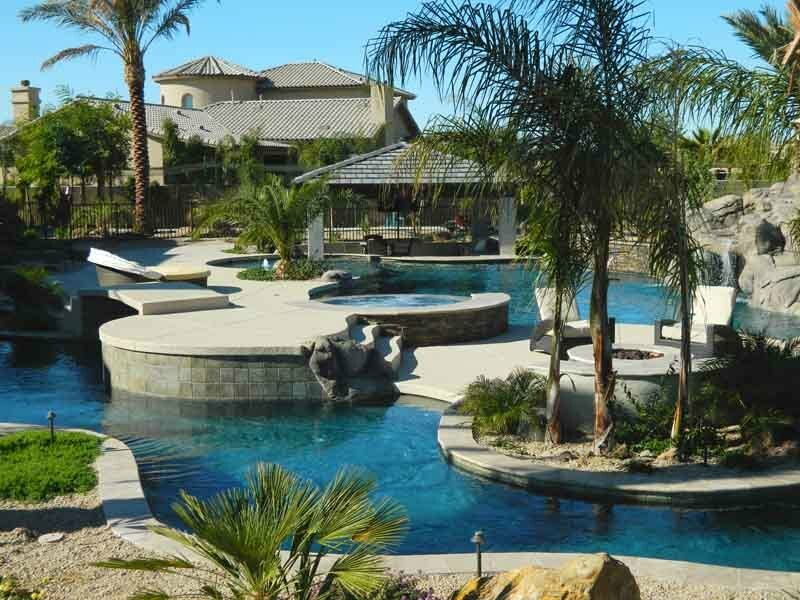 The project started off with a large creative pool and as it went along, we explored the option of the lazy river. As you can tell from the photos below, the two came together beautifully. Designing a lazy river to handle the wants and needs of the client. Unique needed to create a way to push the water fast enough create a strong current. A total of four 5-horsepower pumps were used, strategically placed throughout the river to form a current of 1700 gallons of water per minute. Not too shabby! Designing a filtration system effective enough to handle that size of pool surface area as well as handle the skimming and cleaning of the pool (integrated with infloor cleaning system). Due to the location of the project (Yuma), the water table is only 8 feet below ground level. We had to custom engineer a relief valve for the pool to remain in tact and not suffer structural damage. We had to be able to engineer a system with enough power to handle all of the pumps that also worked seamlessly with the automation system. This was also the single largest Primera Stone interior finish we’d ever done. We worked closely with the manufacturer of Primera Stone, WetEdge Technologies, to ensure a flawless finish! After a few months of hard work, the end result is a backyard that can compete with the best of resorts and one extremely satisfied Unique customer.